The 20189 ACOA Collection – Summary Report is now available! Click here to view the report. To improve alpaca growers’ access to the commercial market for alpaca fleece and reduce the costs associated with selling their clip, the Alpaca Coalition of America is underwriting a national fleece collection initiative modeled after similar collections in the American wool industry. Growers will receive the market price for their graded fleece upon subsequent sale to commercial purchasers. All collection locations will accept properly packed, skirted huacaya and suri blanket fleeces between June 1, 2019, and August 1, 2019. Sorting dates: August 19-20, 2019. Sorting dates: August 11-13, 2019. Sorting dates: August 19-21, 2019. Fleece Payment from Market Consignment Sale: A grower who provides fleeces for consignment sale will have his/her farm’s fleeces individually graded by trained professionals, and included in bales that will in turn be sold to the highest market bidder. Based on previous results, we believe payment will be received by early 2020. Please note that under this option, 15% of the total sales price is retained to compensate trained graders for their services as well as cover costs associated with storage, handling, and the subsequent packaging and shipment of fleeces. Are interested in supporting the development of a viable commercial market for alpaca fleece. Would like a summary grading report of their farm’s fleece production. For administrative reasons, each farm submitting fleeces to the collection must choose one payment plan for all the fleeces they submit. Both huacaya and suri fleeces may be sold or consigned to the program. Only skirted blanket fiber shorn in 2018 or 2019 is accepted. Huacaya fleeces must come from previously shorn animals – no cria tips. Staple length must be between 2” and 5” for huacaya fleeces. There is no staple length requirement for suri fleeces. We ask that you not send fleeces with AFDs you estimate to be higher than 30 microns. These fleeces command so little in the commercial market that it is uneconomical to sell them through this initiative. Blankets must contain minimal vegetable matter, have been properly shorn with care taken to avoid color contamination, and bagged only when completely dry. There should be no holes in the bags – please be careful not to create them when compressing fiber for shipping. Each shipment should include one copy of the summary farm submission form, found here. 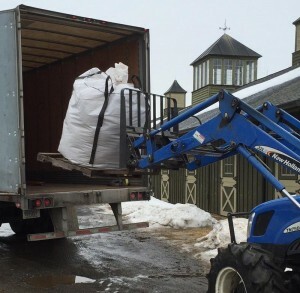 Shipping boxes or bags must be marked with the words “ACOA Fleece Collection.” If the grower wishes to sell their fleeces in the “Underwritten Cash Payment Program”, these words should also be written on the shipping boxes or bags so that they are weighed promptly at the collection site. There are no other requirements. We are just happy you are joining our effort, and thank you for your patience as we work to find the best price for your fiber. Your fleeces will be graded, not sorted prior to sale. This means that a trained professional will put each of your fleeces on a skirting table, evaluate them as a whole, and place them into the grade indicated by the lowest quality fiber present in the blanket. 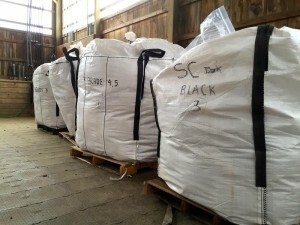 If the blanket fleece is fine but there is coarser belly or britch fiber included in the bag, this will result in the whole blanket ending up in a less valuable grade. The same is true if the fleece is contaminated with vegetable matter or other colors. We cannot do it any other way because we cannot cost effectively sort your fiber for you and must supply the processors using our fiber with the quality they need for their products. Please, skirt your blankets. No appeals of the grading process are possible. While we cannot know in advance what price processors will offer for fiber later this year, we can tell you that in 2016 those who contributed to our collection received average prices ranging from more than $19 per pound for highly uniform grade 1 fiber to $1.58 per pound for colored grade 5 fiber. In most cases, white fleeces commanded more than colored ones, and huacaya fleeces with and staple lengths longer than 3 inches were worth more per pound than those with staple lengths between 2” and 3”. We cannot be certain what prices we will achieve this year, but do know that the more fleece we collect, the more buyers we attract, which has a favorable impact on what we can demand for our fiber. We do believe we are successful at finding the highest commercial bidder for what we have. In some cases the prices commercial buyers will pay are less than those that can be achieved selling fleece in the cottage market, although commercial sale is often more cost effective and may end up being more profitable for many farms. The 2018 ACOA Collection – Summary Report is available – click here. We expect to have the fleece sold by late 2019, with checks to consigning farms sent out promptly thereafter. We cannot guarantee timing, however. When your fleeces are skirted, properly bagged and ready to ship, print out the submission form at www.alpacacoalition.com/forms/ACOA-Fleece-Submission-Form.pdf. Fill this form out and include it in your shipment, or bring it with you when you drop off your fleece at a collection point. Neither ACOA or the individual farms serving as collection points for the National Alpaca Fleece Collection Initiative are the final purchasers of fleeces submitted for market consignment sale, and cannot guarantee the price you will receive for your fleece, or the timing of its sale. As your fleeces will be combined with others for sale purposes, your decision to sell or consign fleeces will be final. No collection facility shall be liable for damage to your fleece that occurs while the fleece is stored at their site.